The origin of the Compassionate Communication Center of Ohio came from Mark Feinknopf, who, together with his life partner, Cynthia Moe, had come in contact with the teachings of Dr. Marshall Rosenberg in 2003. Cynthia and Mark brought Marshall's work and the principles of NVC to their home community in the Atlanta, GA, working with the Carter Center and the Martin Luther King Center. Mark had been a well-known architect in Columbus, Ohio, with a firm bearing his name, and active in many community improvement projects. He retained close ties with Columbus and wanted to see NVC in Central Ohio. A steering committee was formed which initiated the idea of the organization which became CCCO. The organization's initial goal was to bring Dr. Rosenberg to Columbus, a goal that was achieved in March 2006, during which he led a successful 3-day conference. Gayle Saunders (left) and Jerry Saunders, Sr. Jerry was our founding President and the Saunders family hosts many of our fundraising events. 2005 Several Central Ohio residents traveled to Atlanta, GA to attend a training led by Marshall Rosenberg, and hosted by Mark and Cynthia (among these people was Jerry Saunders, Tom Carlisi, Victoria Peyton and Kathy Frank). They and others assembled a 20-person steering committee with the goal to bring Compassionate Communication to Central Ohio, initially by inviting Dr. Rosenberg to Columbus. 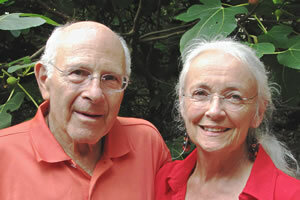 2006 In March, Dr. Rosenberg presented three days and two evenings of training at the Franklin Park Conservatory and the Columbus Africentric High School. Tracy Wimberly became the organization's first Executive Director, and Andy Workum our Operations Manager. Filed for 501(c)(3) nonprofit status with the IRS. 2007 Hosted Dr. Rosenberg for a second time in January for two days of training hosted at the Confluence Park Restaurant. Received $24,000 in startup funds through the Columbus Foundation, gifted to us from a previous community-based project with leftover funds. 2008 In April, hosted a conference with four visiting trainers who were Certified with the Center for Nonviolent Communication (CNVC): Robert Gonzales, Kathleen Macferran, Mary Mackenzie and Jori Manske. 2009 In May, hired our first full-time Executive Director, Jeff Brown, a CNVC Certified Trainer since 2005. Hosted our first community-based conference at the Broad Street Presbyterian Church, with Jeff as lead trainer and nine assistant trainers who were members of the local community. 2010 Hosted a 3-day conference with Robert Gonzales, attended by eighty people and hosted at Temple Israel. Moved into our first office, shared with sister nonprofit organization, Simply Living. Signed a contract to organize trainings for the NVC Training Institute worldwide. 2011 Hosted a 7-day residential retreat at the Procter Center in London, OH, "NVC Train-the-Trainer" presented by the Training Institute. Launched our first major initiative to bring Compassionate Communication into the workplace by hosting Gregg Kendrick for a 3-day training in December. 2012 Organized our sixth community-based conference, attended by a record 95 participants and held at the Martin de Porres Center. Launched our "Parenting from the Heart" project with an 8-week course at the Columbus Montessori Education Center. Completed our first financial audit, for which we received an unqualified report (aka a clean bill of financial and organizational health). 2013 Hired an Operations Manager, Hall Johnson. Hosted two 7-day retreats at the Procter Center in London, Ohio with trainers including Robert Gonzales, Miki Kashtan, François Beausoleil and Jeff Brown. Hosted our 2nd annual social gathering and fundraiser called the "Fun-Raiser" and the home of Jerry Saunders, our founding President. 2014 Hosted our first Family HEART Camp, a week-long residential retreat with children, parents and families. In partnership with the Center for Nonviolent Communication, hosted our first International Intensive Training (IIT) at the Procter Center.